As an Amazon Associate I earn from qualifying purchases. Other links on this site may lead to other companies that I'm associated with. A Margaritaville Party! Jimmy Buffett sure did have a great idea when he sang about Margaritaville. Now it is your turn to celebrate and pay homage! You can’t go wrong with Margaritas and this is a somewhat laid back, relaxed party. Concentrate on awesome decorations, delicious margaritas and great tunes. This party is quite exceptional, because it is always one of the top summer party ideas based on our site visitors! Anything tropical, parrots, or margarita themed. If you don’t find any pre-made invitations that you like, make Hawaiian shirts from tropical themed scrapbooking paper and write the details on the back. 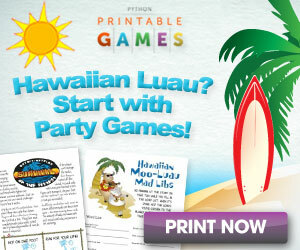 There are lots of Luau Invitations at Amazon.com. Some of these are super cute and could be perfect for a Margaritaville Party or any tropical themed party. Make a signpost directing the way to various locations, with the most important direction to the Margaritaville Party! Disposable plastic tablecloth covers in tropical colors: hot pink, lime green, yellow, turquoise, and orange. 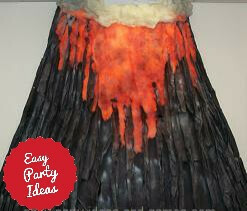 If you are crafty and like to do it yourself, you can try your hand at homemade tropical party decorations like this volcano! Landshark Lager...brewed by Margaritaville Brewing Co. If serving a meal at your party, make sure those cheeseburgers are on the menu! Speaking of cakes...you could also do a pirate cake, or create a "cupcake cake" by arranging cupcakes in the shape of a margaritaglass. Jimmy Buffett, of course!! Lots of it! For a true Jimmy Buffett experience, listen to Radio Margaritaville on Sirius Satellite Radio! Have a big budget? Hire a steel drum band to play as guests arrive or an acoustic guitarist to play during the party! How cool would that be, right? Send your guests home with a lasting memory of your party! Margarita Glasses from the $1 store (decorate each glass by wrapping beaded wire around the stem – helps the guest keep up with their glass AND then they can take them home. Beach Bag filled with sunscreen, beach towels, etc. This makes a great door prize too! © Copyright 2008-2019 easy-party-ideas-and-games.com. All Rights Reserved.